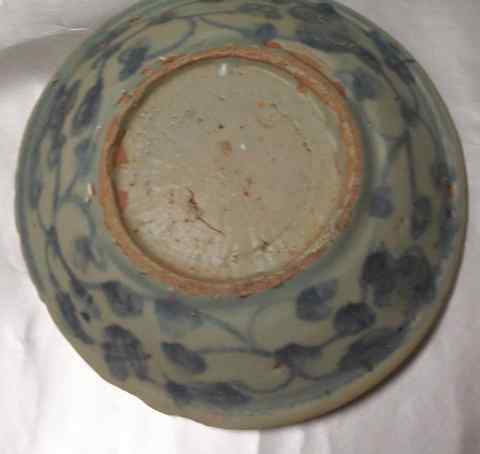 This applies specifically for Ming dynasty porcelain, which sometimes shows very clear age signs. 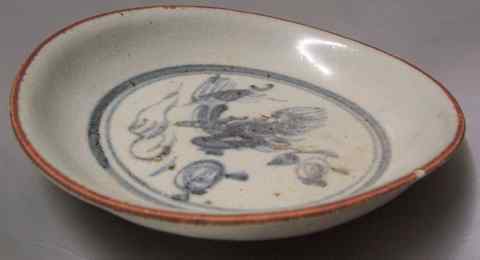 As mentioned before, some characteristics that can be used for judging the age of antique porcelain are not age signs in the sense of material aging. These age characteristics are the result of the production methods or handling techniques in the distant past. They are age signs which are non-specific to the aging process of the material (porcelain) itself; they are rather indicative of the production environment at the time items were made. Glaze contractions and spots where the glaze or slip does not cover the clay were mentioned earlier. In addition to this "warping" or "deformation" is shown in the pictures below. 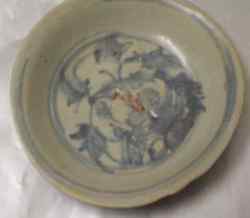 These developed mainly in common dishes, plates or bowls, and are quite frequently found in items of the Ming dynasty. Such deformations would usually develop before the initial firing, which was to stabilise the shape of an item before decoration, after which the items would be fired for a second time. Some thrown items were simply too soft and got deformed, either because of undue pressure applied during handling after they were removed from the wheel, or just because the clay was too soft and the edges changed shape under their own weight. These dishes show quite severe warping. The warping developed before the initial firing, which was to give the items strength. The reason can be improper (too forceful) handling or lacking strength of the clay itself. Only the initial firing gives enough strength to ensure that no deformation can occur.